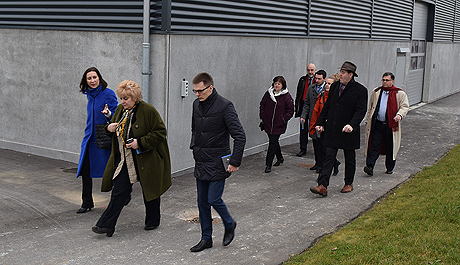 Lead by the Deputy Minister, Responsible for Education and Training, Agriculture, Elena Astrakhantseva a Group of 18 Russians with veterinary responsibilities visited the Large Animal Teaching Hospital, School of Veterinary Medicine and Animal Science, University of Copenhagen. Tuesday, 20 December a delegation from Russia, who were guests of the Danish Agriculture & Food Council, visited the Large Animal Teaching Hospital in Taastrup. 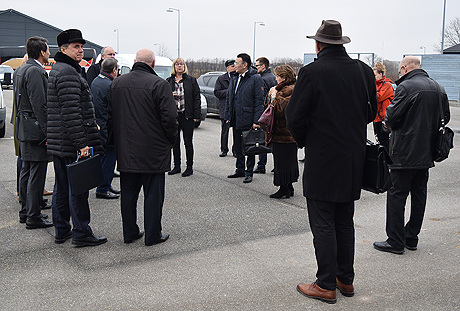 The delegation’s visit to Denmark was initiated to discuss a possible future twinning project on veterinary education between Moscow State Academy of Veterinary Medicine and Biotechnology from the Russian side and the University of Copenhagen. The delegation also wished to discuss practical questions of the veterinary education and to see how we trained the future veterinarians in Denmark. After a short welcome by Head of Department Hans Henrik Dietz, there was a short introduction to the Veterinary education at UNICPH and to the outlay of the hospital by Hospital Director Susanne Nautrup Olsen, who afterwards gave a tour of the hospital facilities from stables to surgical training rooms and from skills lab to operation theatres. 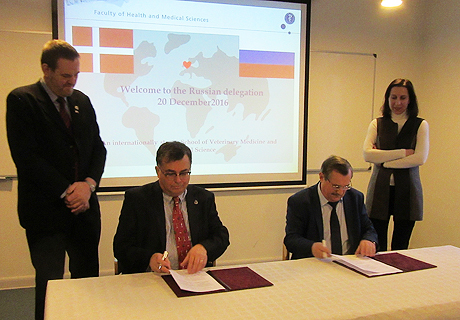 Following this intense program the Russian team was introduced to the Danish veterinary training program in general and a Memorandum of Understanding was signed by Rector Fjodor Vasilevich and School Director Hans Henrik Dietz. The visit will be followed up during the next few months to investigate the potential collaborative efforts.